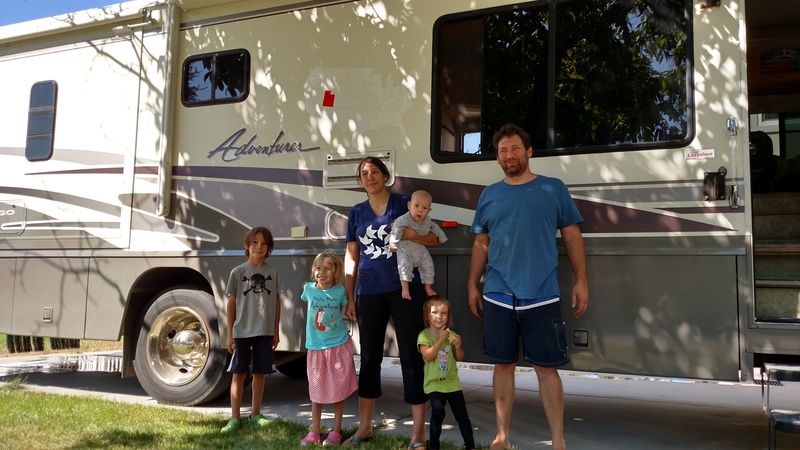 Today we loaded up all our things into an RV (and a 10×20 storage unit) and drove away from our home in Orem, Utah to Winnemucca, Nevada. It’s a lot farther than you think. A lot more preparation goes into planning a move like this than it sounds like. But a lot less than you’d think. And probably we should have done a lot more than we did. It’s only the first stop on our year long (or more) plan to travel around the country as a family and see what we can see. While I work remotely and Kelsey home schools our kids. Our first destination is Oregon. To see Crater Lake, and show my family where I used to live. Then to Selenium Conf in Portland, and then Seattle, and then a meandering line from there to Florida where I have another work conference in December. That’s a lot of miles — and it doesn’t leave a lot of time for stopping to smell the roses. As the day of our departure neared, I didn’t think we could do it. While I worked, Kelsey cleaned the house and put into storage (or sold) all that we had. I was supposed to fix up the RV. I ordered & installed solar panels, a new inverter and batteries capable of running my office on wheels. But I didn’t get it hooked up to the house power. So we have 4 100 watt flexible solar panels mounted on the roof with 3M Dura Lock (think super velcro) generating power to loose wires, a charge controller (Midnite Solar Kid) in the drawer, and a 2000 watt Samlex inverter & 12 volt, 150 amp hour batteries mounted in a storage compartment and not hooked up to either the solar panels or the house electrical system. I was also supposed to install our tow package. It didn’t come until last weekend, and I didn’t get it installed either. But Kelsey got the house done and we put our last load in storage this morning and checked out with the landlord a bit late. By the time we left, it was 11:30am (not nine). Because the tow package wasn’t hooked up, I drove the truck behind Kelsey in the RV with the kids divided between us an switching back and forth at every stop — of which there were many. 8 hours into a 5 hour trip, I calculated we were averaging 35 miles per hour. Finally we pulled into an RV park in Winnemucca, and we made our destination just before dark at 8pm. Everyone was in meltdown mode, except baby Mikey who was happy to be out of his car seat and went to bed quickly. Kelsey is frazzled from driving the RV for 9 1/2 hours — which is much more demanding than driving a regular car. But now everyone is sleeping happily, and hopefully ready to continue our journey. I want to get to our destination in Oregon by Sunday morning so I can go to church and see if I can meet anyone I knew back when I was in school. We still have piles of stuff all over that we need to figure out how to stash or learn how to let go of. And we still need to build bunks for the kids. But we made it. It’s less about having the right plan and more about committing to do something and then do it. See you at the conference in Portland.